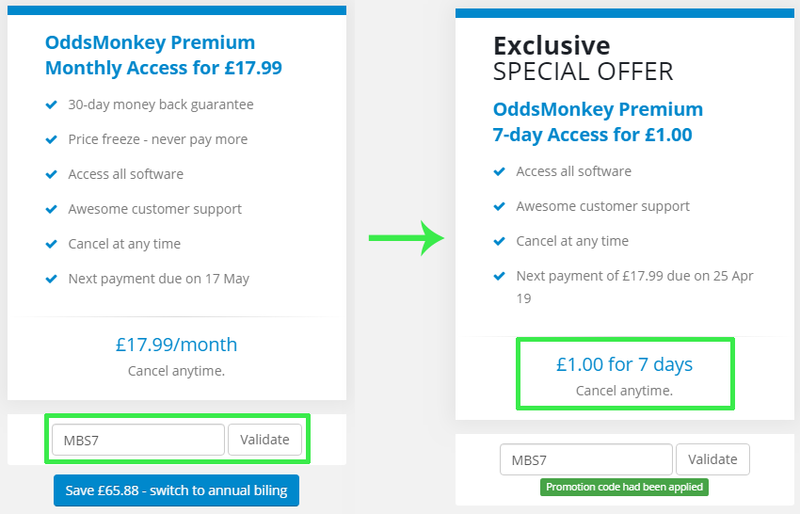 OddsMonkey are one of the leading matched betting services and we've been able to secure an exclusive promo code which will allow you to trial their premium membership for just £1. OddsMonkey have helped tens of thousands of members generate a profit from matched betting and so it's no surprise that they are one of the most popular matched betting sites. Members have access to hundreds of bookmaker, casino and bingo offers along with a range of matched betting tools which makes the process quick and easy, even for beginners. Joining OddsMonkey has a number of benefits with one being 0% commission across all bets at Smarkets, saving you money on your lay bets and adding to your overall profit total. By entering the OddsMonkey promo code, you can get access to OddsMonkey Premium for 7 days for just £1. OddsMonkey currently offer a free trial but access to offers and tools is extremely limited. A premium membership gives you access to all offers, tools, support & training to allow you to make a profit on a daily basis. Follow these simple steps to claim the discount. You will only qualify for the discount if you sign up via the button below and not direct through the website. After entering your details, you will be asked if you have a promo code. Enter MBS7 and click the 'validate' button. The price will update to £1 for 7 days. Pay your £1 via the secure online payment form and you will have instant access to OddsMonkey Premium for the next 7 days. You can cancel your membership at any point during your 7 days via the account details page should you wish to. 7 days premium access to oddsmonkey for only £1!